James Grage: So here’s a question for you. You and I talked about that marker on the glycemic index being at about 40. Dr. Brett Osborn: That’s my marker. Whitney Reid: So nothing over 40? Ok.
James: Oatmeal would be what? 75-80? Dr. O: Ya, oatmeal is up there. Whitney: So no oatmeal for you? Dr. O: Look, I’m different. You’re different. 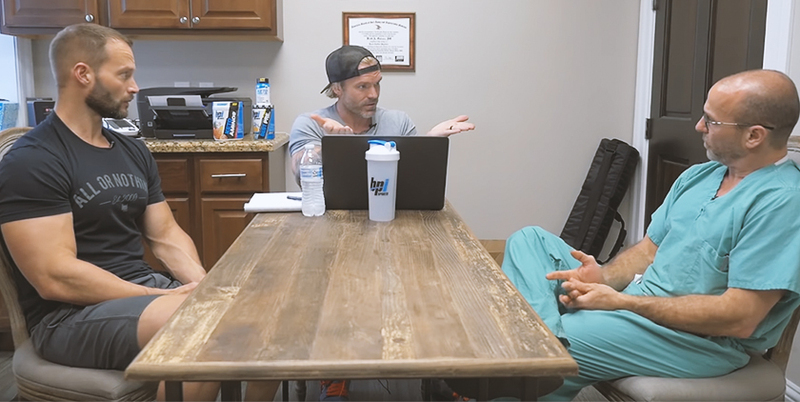 We’re sort of a little different by virtue of carb sensitivities, but when I have a patient in here, most people come in here and need to lose fat. I tell them that they have to be strict and stay below 40. James: So here’s a misconception. People associate fruit with a lot of sugar, so they don’t eat it. I think one thing people don’t understand that well is that fruit has both fructose and glucose. So it depends on the ratio. Say like an apple, which is slightly higher in fructose than glucose, is ok. It falls lower on the glycemic index, under 40. Dr. O: Remember, the reason why a lot of these fruits are “ok” per the Osborn standard is because they have a lot of fiber in them. So one of the tricks that I use with my patients is if you’re going to eat a crappy meal, go eat some fiber gummies. Because that’s going to lower the glycemic response. Dr. O: Well you gotta be careful. The minimum recommended amount of fiber is 25g per day. Most people get nothing! But you do have to be careful with these fiber gummies because they’re made palatable by using mannitol and that will just kill your stomach. So that’s a good little trick if you can tolerate the sugar alcohols. But the apples? They’re around 38. James: 36. But to your point, it’s not just higher fructose, which for the people who don’t understand, your body doesn’t process fructose like glucose. So it’s just in the liver, right? James: So you don’t get the same insulin response from fructose, that’s one reason, but your other point is that it has naturally-occurring fiber. Dr. O: It has fiber. James: And that’s why when you juice, you get the big insulin response because you’re taking all the fiber out of the fruits. Dr. O: You have to be really careful with juicing. Just stick with the low-glycemic carbohydrates. Anything less than 20 and you can have juice. It’s fine. It’s not gonna do anything to you. That said, as with everything else, if you are in ketosis and you want to find out whether or not juicing is bad for you, well, make four different juices and check your blood ketones. Then you’re gonna know where you are. If ketones are such a big deal for you, then do that. For me, it’s not a big deal. I just know what the glycemic index is, and as long as my glycemic load isn’t crazy… like an apple is fine. But let me tell you, if you eat 17 apples? Your sugar’s gonna go through the roof. But getting back to your question, James, one of the reasons why I cut people off from things that are even 35-40 on the glycemic index is because of the psychology of the individual in my clinic. They’re not you. Dr. O: Damn right. So what do I want to get rid of? Dr. O: The need to have something sweet in their mouth. James: That’s hard to kill for some people. Dr. O: Why do you think diet soda doesn’t contribute to weight loss? Do they help the people that are addicted to that sweet taste? No! They fuel it! It’s worse! So it’s not that I don’t want people to have an apple. It’s that it starts with an apple, and then the next thing is, “Mmm that M&M looks pretty good.” I want my patients to wean themselves off the need for the sweet taste.